With Main color yarn and 4.00mm hook, ch4, sl st to first ch to make a ring, ch3, 2dc in ring, ch2, (work 3dc, ch2, three more times in ring), sl st to top of ch3 on beginning of row. Row 3 - ch3, 1dc in each of next 4dc, * (2dc, ch2, 2dc) in ch2 space on corner, 1dc in each of next 7dc, * rpt from * to * twice more, (2dc, ch2, 2dc) in ch2 space on corner, 1dc in each of next 2dc, sl st to top of ch3. Fasten off. Row 4 - ch3, 1dc in each of next 6dc, * (2dc, ch2, 2dc) in ch2 space on corner, 1dc in each of next 11dc, * rpt from * to * twice more, (2dc, ch2, 2dc) in ch2 space on corner, 1dc in each of next 4dc, sl st to top of ch3. Row 5 to 7 - ch3, * 1dc in each dc to corner, (2dc, ch2, 2dc) in ch2 space on corner, * rpt from * to * until you have worked all four corners, work 1dc in each dc to end, sl st to top of ch3 on beginning of row. Fasten off at the end of row 7. Join in contrast color yarn and work last row once. Turn. Edging - Work ch1, 1sc in base of ch1, 1sc in each sc and 3sc in all corners to end, sl st to first sc on beginning of row. Turn. Fasten off. 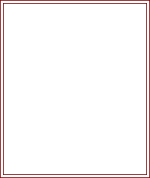 Next Row - Join in main color and rpt last row once. Turn. Next Row - ch1, 1sc in base of ch1, * ch1, skip 1sc, 1sc in each of next 2sc, * rpt from * to * around all four sides of doily, working 3sc in corners, sl st to first sc on beginning of row. Turn. Next Row - ch1, * (sl st, ch3, 2dc, ch3, sl st) in next ch1 space, skip 2sc, * rpt from * to * to end, sl st to first sl st. Fasten off. Flower (Make one in each of 3 contrast colors) - With 4.00mm hook, ch15, work 2hdc in 3rd ch from hook, (skip ch1, 3hdc in next ch), twice, (skip ch1, 3dc in next ch), three times, skip ch1, sl st in last ch. Fasten off. Roll from hdc to dc's to make flower shape, secure at the back with loose ends of yarn. Leaf (Make 2) - With green color yarn and 4.00mm hook ch10, 3dc in 4th ch from hook, 1dc in each of next ch3, 1hdc in next ch, 1sc in next ch, (sl st, ch2, sl st) in last ch, (makes a point), working on opposite side of cast on ch, work 1sc in next ch, 1hdc in next ch, 1dc in each of next ch3, 3dc in last ch, sl st to top of ch3. Fasten off. 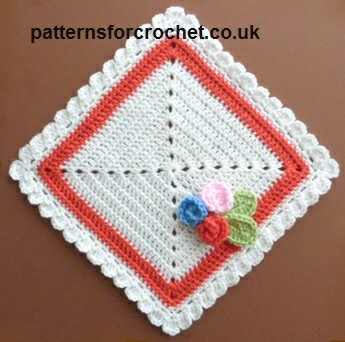 Hope you enjoy this pretty square doily free crochet pattern.